Dr. Hitchcock: Yes. It is called The Lost Book of Nostradamus. 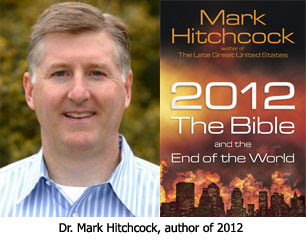 You can get on the Internet and look up and see his drawings, and that is where some say he points to 2012. But, the problem is supporter of a 2012 end-of-the-world scenario look at these intricate drawings and they'll say, "that this means this, and this means this, and this means this, therefore it points to 2012." But, if they're wrong at one point along the way it is like a house of cards — it all comes down. 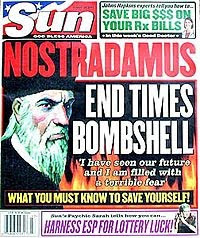 Nathan Jones: That reminds me, back in the 1980's Orson Welles did this big special on everything Nostradamus said, and he predicted J.F.K. getting shot and everything all the way up to that point that Orson Welles did that show. He then made a big deal about looking into the future. He said Nostradamus predicted world cataclysms for the last part of 80's and the destruction of the world in the '90, but no such thing happened.